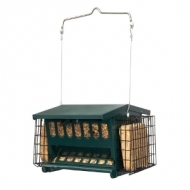 Double-sided hopper type feeder to attract a wide array of birds by offering multiple treats at one station. 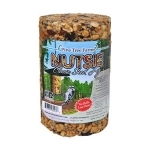 Holds up to 5.5 lbs of mixed seed plus 2 suet cakes. 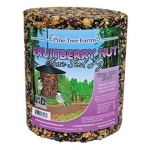 Stop birds from shoveling food out with the no-waste seed saver baffle. Durable, chew-resistant green powder coated steel body with a zinc-plated hanger. 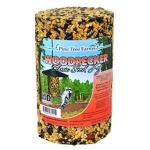 Squirrel resistant lid allows easy filling and cleaning. Clear panels allow monitoring seed-levels. 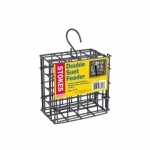 Suet baskets feature a snap-on latch for easy filling. Made with insect and rot resistant premium cedar. Tail-prop design ideal for attracting large woodpeckers like the Pileated to your backyard. 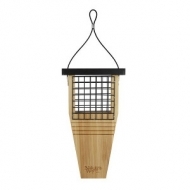 Skerfs provide additional gripping surface for birds to cling. Easy to fill. 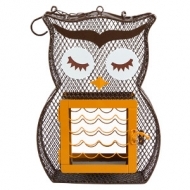 Stainless steel wire mesh basket. Rust-free hardware; stainless steel screws. Water-based protective stain. Vinyl coated steel hanging cable. Exclusive 5-year warranty. Dimensions: 14”H x 7 7/8”W x 3”D Weight: 1lb 5oz. Ingredients: Mixed Tree Nuts. Peanuts. Almonds. Cracked Corn. Sunflower Hearts. Black Oil Sunflower Seed. Gelatin. Ingredients: Mixed Tree Nuts. Peanuts. Sunflower Hearts. Pecans. Dried Fruit. Gelatin. Ingredients: Black Oil Sunflower Seed. White Millet Corn. Red Millet. Mixed Tree Nuts. Peanuts. Blueberries. Other Dried Fruits. Gelatin. Flavoring.